Follow me to Sitcom Land, where my favorite characters’ outfits are as loud and fearless as their personalities! Do you dare to wear animal print from head-to-toe? You will if you take a few cues from some of TV’s most outlandish style mavens! Get your wardrobes ready for some serious sartorial inspiration, my boos. Ahhhhh, Kimmy Gibbler. Full House (1987–1995) would not be the same without her living next door to, and annoying, the Tanners. As D.J. Tanner’s BFF, Kimmy is constantly in the family’s orbit, much to their total dismay. They mostly find Kimmy to be invasive and odd, spitting out such quotable gems as, “I had a traumatic experience with squash once: I ate one.” Kimmy is underappreciated IMO, and so is her unique taste in clothes. Is that a turquoise off-the-shoulder, marabou-accented top I spy? Get some of that Gibb-steeze by sporting the brightest clothing and accessories known to man. Next time you second-guess a pair of cheeseburger earrings, consider that you’d totally have Kimmy’s blessing. Clockwise from far left: Reversible sweatshirt, $130, Clashist; ’80s bracelets, $2.50 for set of 12, Coolglow; Obsessive Compulsive Cosmetics nail polish in Deven Green, $10, Sephora; scrunchie, $6, American Apparel; cheeseburger and fries earrings, $20, Etsy. The Nanny (1993–1999) is a vivacious, outgoing woman named Fran Fine. After getting dumped by her boyfriend and fired from her job, she gets a gig taking care of the three Sheffield children. Fran is different from the well-to-do Sheffields for a lot of reasons. A big one is her nasally voice. Another is her AMAZING fashion sense. Fran’s outfits are eccentric, imaginative, and one-of-a-kind. FRAN, YOUR WARDROBE IS MY LIFE’S GOAL. Thanks to her, when I see a bold print, I stare it down and say, “Get on me now!” This black-and-white checkered dress, for example, is totally Fran! But don’t stop there: Accessorize with an over-the-top piano-keys clutch. Daaang, you look amazing. The Nanny would be so proud. Clockwise from far left: Checkered dress, $18, Ci Ci Hot; piano-keys purse, $53, Betsey Johnson; OPI nail polish in The Thrill of Brazil, $10, Ulta; diamond-print heels, $26, Maykool; fabric headbands, $5.50 for pack of five, Walmart. Peg Bundy, the matriarch on Married With Children (1987–1997), has a demanding schedule, packed with daily activities such as napping in front of the T.V., shopping, and generally avoiding any sort of housework. Thankfully, Peg also has time to curate outfits that are A++. While her baby girl, Kelly, knows how to work a true rocker bad-girl look, Mrs. B. has ’60s throwback style on lock. A fan of leopard print and polyester, she might as well be a secret John Waters character—especially because she seems to understand the Waters-ian belief that “hair can’t just hang there like a dead thing on your cheeks.” Clone Peg with a leopard-print jumpsuit and some red accessories. Don’t forget to grab a teasing comb and some maximum-strength hair spray so you can recreate her famous bouffant. Far left: Leopard-print jumpsuit, $35, Sears. Clockwise from top center: Earrings, $42, Saks Fifth Avenue; faux patent-leather belt, $18, Kohl’s; platforms, $14.50, Clothescheap.com; lipstick in Shocking Pink, $6, NYX Cosmetics. 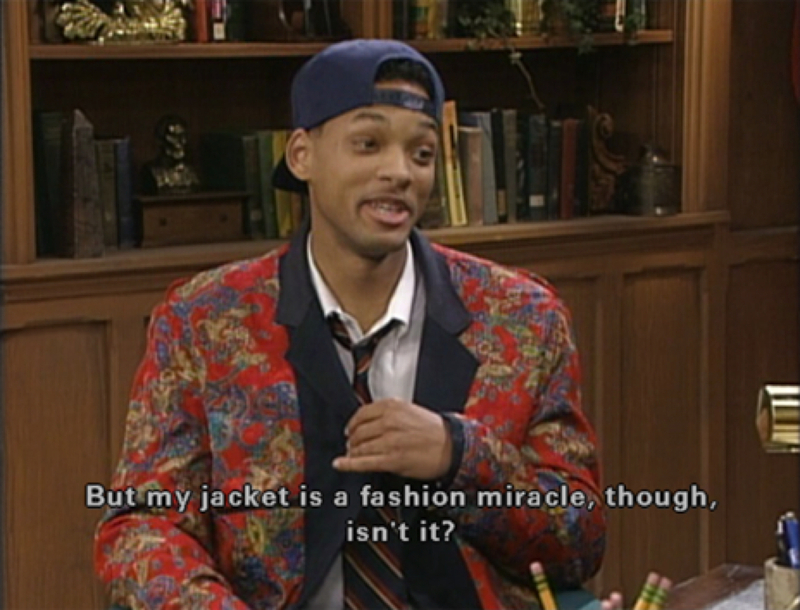 The Fresh Prince of Bel-Air (1990–1996), aka Will Smith, had quite a few memorable style moments, like when he wore his private-school uniform’s blazer inside out to reveal a colorful paisley pattern. But it’s Hilary Banks, his snobby and spoiled eldest cousin, who is the show’s more serious fashion plate. Hilary wears a lot of oversized blazers, crisp white shirts, and other ’90s menswear–inspired pieces, and she’s a huuuuge fan of the wide-brim bowler. You gotta respect someone who can always match a hat to their outfit. Mimic Hilary’s tony look in a pink pantsuit topped off with some statement necklaces—and a coordinating hat, of course. Far left: Blazer, $85.50, and trousers, $53, Missguided. Clockwise from top center: necklace, $75, Zappos; bowler, $24, Pilotuk; earrings, $12, Overstock.com; heels, $70, ASOS. doesn’t this article belong in the Style category instead of the Movies + TV category? I loved Fran’s style so much! The mint green cashmere crop sweater in that episode about the teacher, which she wears on top of a metallic bra (how cool was that!?).. It ll be also good to have some Sabrina the teenage witch here, I remember that episode in which Libby wore mis matched knee high socks with short skirt! Loving how much Fran Fine has been featured here lately. And Kimmy is the bomb.com! !